InterFax Integration integrates your WooCommerce site with the InterFax online fax service, enabling you to fax order details to customers and yourself for every order being processed and/or completed. The fax content uses the same template as the order complete email. To use this extension, you need to have an InterFax account. Register for an account here. Note: This product has been retired and is not for sale. Documentation is no longer being updated. Download the extension from your WooCommerce.com dashboard. Go to: WordPress Admin > Plugins > Add New > Upload and select the ZIP file that you just downloaded. Learn how to set up and configure the plugin in the next section. 1. 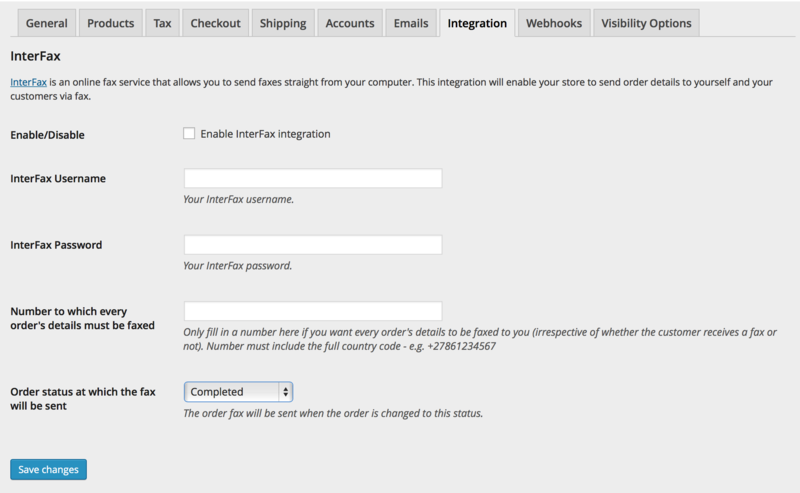 Go to: WooCommerce > Settings > Integration > InterFax and tick the Enable InterFax Integration box. Optional: A fax number to which every order’s details will be sent. This is ideal if you require a faxed copy of every order sent to yourself. Your fax number must include the full country code – e.g. +27861234567. Order status (when to send): Choose Processing or Completed. This is ideal if you have a food service and need a fax sent when receiving a customer’s order and not only when the order is fulfilled. When the extension is enabled, a fax number field is added to any area where a billing address is edited, including checkout. Your customers can add/edit their fax number in the same space they add/edit their billing address. If a fax number is present at checkout, then order details are faxed to the customer once the order is processed or completed. You also receive a fax with every order, if you entered your fax number in the extension settings, regardless of whether the customer receives one or not. Faxes use the same template as the order details email. If you need to resend a fax or they were not sent for some reason, you can use the ‘Order Actions’ menu in the order edit screen of the dashboard to send it to the customer or to yourself. A fax will not be sent if your InterFax account is out of credits. This can be fixed by purchasing more credits for your InterFax account, then resending the order using the ‘Order Actions’ menu in the order edit screen of the dashboard. How can I remove the fax field added to the checkout page?